Transient markers show where the transients of a clip are (areas where the level increases suddenly), and are used to edit the timing of audio clips. AudioSnap finds transients automatically, but the transient markers don’t always appear exactly where you might want them for the kind of editing you want to do. Most AudioSnap commands edit transient markers automatically as a result of an editing operation, but sometimes you achieve the best results by editing the markers manually. You can edit the markers by moving them to new locations, adding markers, filtering out markers, deleting markers, and promoting markers (protecting them from being filtered). Dark blue = slightly stretched. Light blue = heavily stretched. Dark red = slightly compressed. Light red = heavily compressed. Figure 296. AudioSnap waveforms are color-coded to indicate if they are stretched or compressed. Click the desired transient marker. Right-click a clip and choose Select Markers > All or Select Markers > None on the pop-up menu. Draw a lasso around the desired transient markers. Click the first marker in the range, hold down the SHIFT key, and click the last marker in the range. Hold down the CTRL key and click the desired transient markers. Select the clips that you want to edit. Double-click a transient marker in any selected clip. All transient markers near the same position (within a defined time window) in all selected clips are selected. Note 1: If no clips are selected, transient markers from all clips are eligible to become selected. Note 2: To specify the size of the time window, click the AudioSnap Options button in the AudioSnap palette to open the AudioSnap Options dialog box, then specify the desired Pool Transient Window value. When editing multi-track instruments, you may want to simultaneously adjust a range of transients across multiple tracks. In order to do so, you need to select the tracks and time region you want to edit. Hold down the CTRL key and double-click another transient marker in any selected clip. A range or transient markers are selected across all selected clips. Selecting all markers of a certain type makes it easy to perform operations such as resetting only the stretched markers, or promoting only the disabled markers. Point to the marker, then drag the marker handle (diamond). Figure 297. To move a transient marker, drag the marker head (diamond). Figure 298. To stretch a transient, drag the marker line. When you drag and drop the line of a marker, the marker moves to the place where you drop it, and the audio that is located between the dragged marker and the following marker stretches. Note: If you stretch a transient marker, AudioSnap is enabled on the clip. 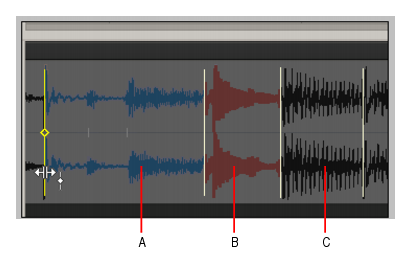 The waveform of stretched segments are colored blue, and the waveform of compressed segments are colored red. Figure 299. AudioSnap waveforms are color-coded to indicate if they are stretched or compressed. You can find additional marker editing commands on the transient marker context menu. Select the desired transient markers. Drag any of the selected transient markers. Hold down the CTRL key and drag any of the selected transient markers. Select all transient markers you want to reset. Right-click any selected transient marker and select Reset from the pop-up menu. Right-click the marker you want to disable and select Disable from the pop-up menu. Right-click the marker you want to reset and select Delete Marker from the pop-up menu. Note: You can only delete user-created transient markers. Hold down the ALT key and click where you would like to insert a new transient marker. A new transient marker is inserted. Disable the Snap to Grid button (or press the N key) if the place you need the marker is not on a convenient snap location. Select the clip or clips that need the marker. Move the Now Time to the place where you want the marker. The marker appears in the selected clip(s). Manually inserted transient markers are slightly shorter than auto-detected transient markers. Note: You can also add markers at Pool lines with a single command. See To add markers at Pool lines. Figure 300. Manually inserted transient markers are slightly shorter than auto-detected transient markers. The AudioSnap palette appears and all audio clips show transient markers. Select the target clip (the clip that you want to copy markers to) and drag the Threshold slider in the AudioSnap palette until all transient markers are disabled. Select both the source clip (the clip you want to copy markers from) and the target clip. Right-click either of the selected clips and select Merge and Lock Markers from the pop-up menu. The transient markers on the source clip are copied to the target clip. It’s sometimes necessary to disable some of the markers so you can extract a clearer groove, or snap or quantize data to only the more important markers. Disabling markers is a way to thin the data so that it creates a clearer time grid to work with. It also avoids stretching any transients that you don’t want to stretch as a result of quantizing audio. Disabled markers are not deleted, but are ignored by all AudioSnap functions. Only the head of a disabled marker remains visible. The Resolution drop-down list in the AudioSnap palette. The selected Resolution value lets you disable markers based on their time location. This clears out unwanted markers to make editing easier. Larger values create a bigger time window, based on musical time values, which preserves markers that are closest to the displayed musical time value, and disables others. Note: The Resolution setting will only work reliably if the audio clip’s internal tempo map is accurate. For details, see Editing a clip’s tempo map. The Threshold slider in the AudioSnap palette. This slider works by disabling markers based on their volume. Dragging the slider to the right creates a larger volume threshold, so that transients that fall below the current volume threshold that the slider defines are disabled. The transient marker context menu. You can right-click a marker, and choose Disable from the pop-up menu. Press CTRL+ALT+D to disable or re-enable all selected markers. Tip: If you want to protect a marker from being disabled by the Sensitivity slider or the Threshold slider, you can right-click the marker and enable the Promote option from the transient marker pop-up menu. You can also promote a disabled marker to ensure that it never becomes enabled by the Sensitivity slider. To move the Now Time to the next transient, press TAB. To move the Now Time to the previous transient, press SHIFT+TAB. Note: TAB to transients is selection-based, which means tabbing will go to the next/previous transient amongst all selected clips. If there is no selection, tabbing operates on the current track. For more information, see TAB to transients. Each transient marker changes its appearance when it is selected, moved, new, disabled, or has certain other characteristics. The marker handle is only visible when you point to a marker. The following table lists the variations in appearance that a marker can display. Standard active marker or promoted marker. A promoted marker is never disabled by the Resolution or Threshold controls in the AudioSnap palette. The transient marker context menu appears when you right-click a transient marker. The command you choose from this menu acts on the marker that you right-click, and most commands also act on any markers that are selected. The following table describes each command. Moves a marker back to its original position. Shortcut for selected markers is CTRL+ALT+R. The marker is ignored. Shortcut for selected markers is CTRL+ALT+D. By “promoting” a marker, you can set emphasis on certain beats and prevent the marker from becoming disabled when you adjust the Resolution or Threshold controls. Shortcut for selected markers is CTRL+ALT+P. Only available for manually added markers; the command is grayed-out if you right-click an automatically generated marker. Shortcut for selected markers is CTRL+ALT+BACKSPACE. Moves marker to nearest Pool marker. Note: You can also snap transient markers to the Time Ruler and other transient markers. For details, see To add the Time ruler to the Pool and Snapping edits to audio beats. Moves marker backward to nearest Pool marker. Moves marker forward to nearest Pool marker. Moves the marker to the project time that you enter in the To Time field, and stretches the audio that is between the previous and next markers. Moves the marker to the project time that you enter in the To Time field. Auditions the clip up to the next marker. Default shortcut is CTRL+SHIFT+SPACEBAR. Splits the beat at the marker. Opens the AudioSnap palette. Shortcut is ALT+A to show (but not hide) the palette.